My family had recently moved to a new city, and we were visiting a new church. The service started well, but moments after the preacher entered the pulpit, my heart stopped. This was going to be the worst sermon I had ever heard. Quickly, the preacher checked off my pet peeves for poor preaching. Topical message? Check. Mechanically reading his manuscript the entire time? Check. PowerPoint slides? Check, check, and check. I soon dismissed the sermon and decided we would not attend this church ever again. I decided that his lack of theological sophistication, sermon craft, and public presentation disqualified him from being worthy of my attention. But more troubling than his lack of rhetorical ability was my lack of spiritual maturity. I have had the privilege of sitting under some of the very finest Bible teachers, and yet, by dismissing this preacher, I missed a great opportunity for growth. Poor preachers are gifts from the Lord. That’s what I learned, ironically, from one of the greatest preachers who ever lived. In his Institutes, John Calvin argues that pastors are necessary kingdom workers. Calvin learned this from the apostle Paul, who taught that God is the one who gives the church shepherds and teachers (Ephesians 4:11). Calvin explains that the Lord “uses the ministry of men to declare openly his will to us by mouth, as a sort of delegated work, not by transferring to them his right and honor, but only that through their mouths he may do his own work — just as a workman uses a tool to do his work” (4.3.1). Because of this delegated work, unimpressive preachers provide believers with a unique opportunity. Calvin writes, “When a puny man risen from the dust speaks in God’s name, at this point we best evidence our piety and obedience toward God if we show ourselves teachable toward his minister, although he excels us in nothing” (4.3.1). That’s right, Calvin argues that believers can demonstrate their love for Christ by paying attention to “puny” preachers. Mature believers can see beauties that unbelievers and baby Christians miss. Before he was a believer, Augustine dismissed the Scriptures for their lack of eloquence. After his conversion, though, he testified, “Where I understand them, it seems to me that nothing could be wiser, nothing more eloquent than the sacred writers” (On Christian Doctrine, 4.6.9). The gospel of Christ must always rule over the desire for beautiful expression or else posturing and pretence is sure to follow (On Christian Doctrine, 4.28.61). When Calvin exhorts us to pay attention to puny preachers, he is calling us to recognize the idol of eloquence. The Corinthian church followed this idol when they dismissed Paul because of the ineloquence of his speech (1 Corinthians 2:1; 2 Corinthians 10:10). We can show our ultimate allegiance is to the Lord Jesus and not to any bumbling messenger of his. Calvin provides two specifics to help us listen well to a poor sermon. First, he calls us to listen carefully to demonstrate our affection for Christ himself. 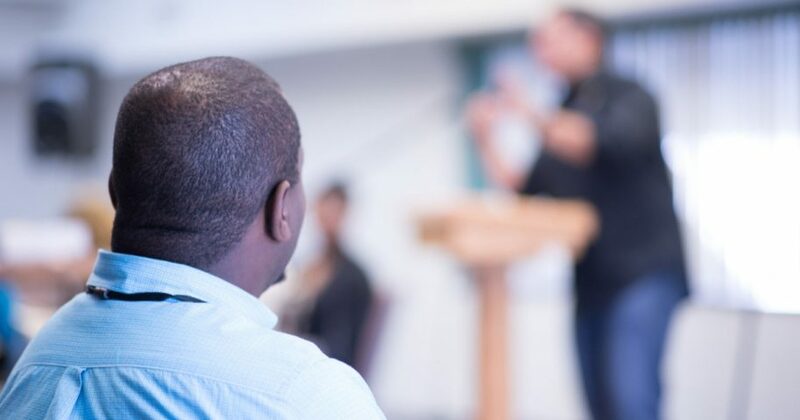 By giving our attention and listening carefully to a poorly crafted presentation, we recognize and demonstrate that the ultimate message being spoken is not the poorly formed sermon from the preacher but the very word of God that the Spirit is speaking to his church each Sunday morning. We don’t receive life from the preaching of the preacher, but the written and preached word points us to the living Word, Jesus Christ. Just as a loving husband notices his wife even when she is dressed grubbily, Christians can show their love for the living Word of God when he is proclaimed by inelegant preachers. Second, Calvin calls us to listen carefully to demonstrate our obedience to Christ. A sermon is not primarily an exercise in rhetorical skill. Instead, it is a proclamation of Christ’s finished work with implications for holy living. Believers can demonstrate that they understand this fundamental distinction by listening to a poorly crafted or poorly executed sermon with the goal of holy living. We are not serving men — including our own pastor. It is the Lord Christ we serve (Colossians 3:22–24). By hearing and obeying his call, we demonstrate our love for him and our affinity with him. And so may the Lord protect us from this worldly temptation. The Lord commanded his preachers to speak “as one who speaks oracles of God” (1 Peter 4:11). May we recognize that when we hear a sermon, the preacher carries the heavy load of speaking for Christ. This preacher may not have theological sophistication or public eloquence, but if he has the word of God and the Spirit of God, then may God give us ears to hear what the Spirit is saying to our church through him.